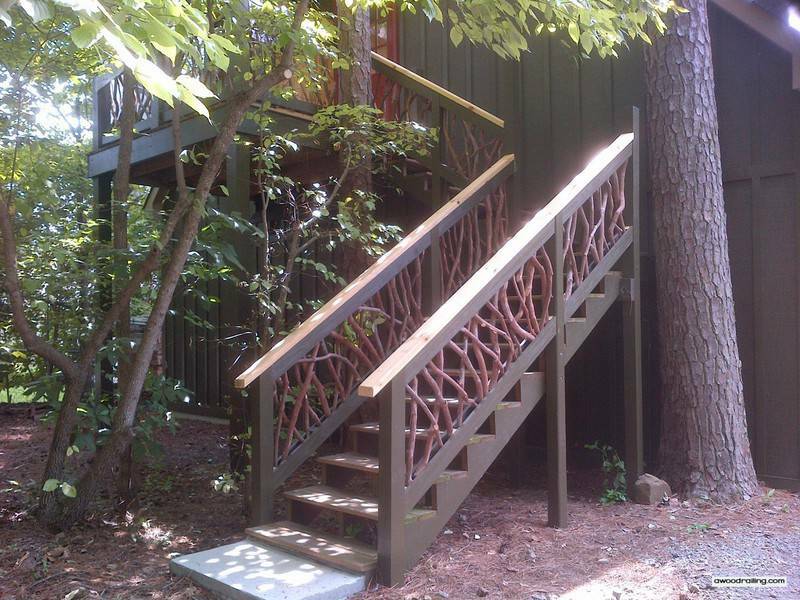 Get a taste of North Carolina with handrails and railings made in the resort lodge style! 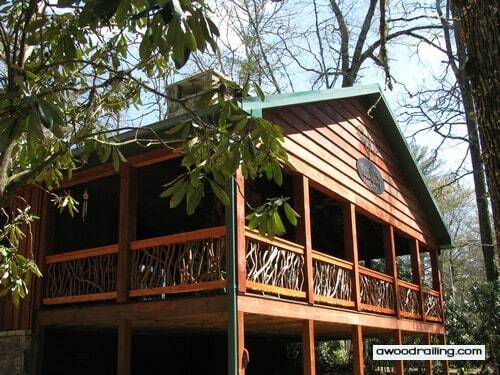 These Mountain Laurel Handrails were installed on this cozy home in Highlands, North Carolina. 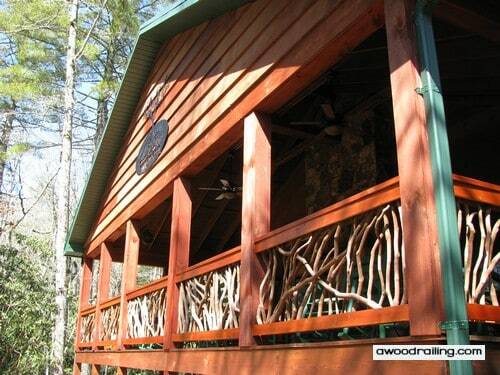 The mountains of Western North Carolina is where the traditional art of using mountain laurel branches and twigs for rustic deck railing began. The local craftsmen and carpenters recognized the inherent beauty of the sticks and began a style which now decorates homes across the United States. 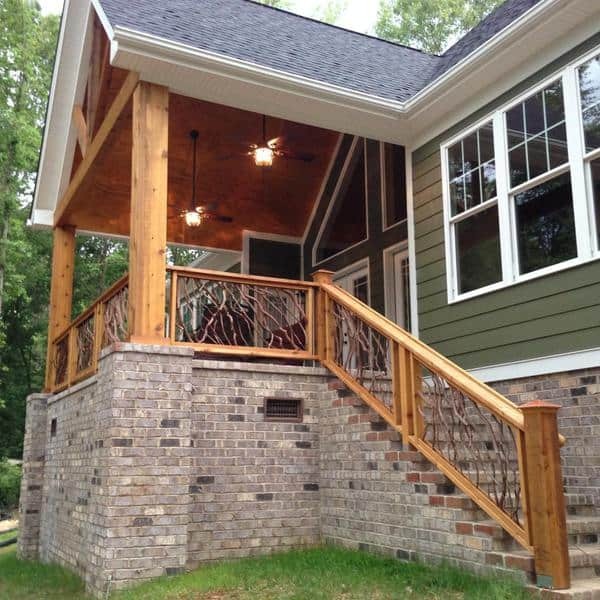 This covered porch is a great place for such beautiful North Carolina railings! This particular porch has a view of the neighborhood road and is a good place to sit and catch up. 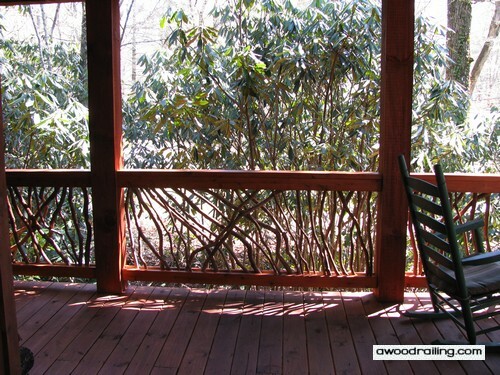 The woven branch railings blend nicely with the rhododendron bushes that grow in the mountains. This organic style of decorating helps to blur the boundary between the North Carolina handrail and the exterior of the home. 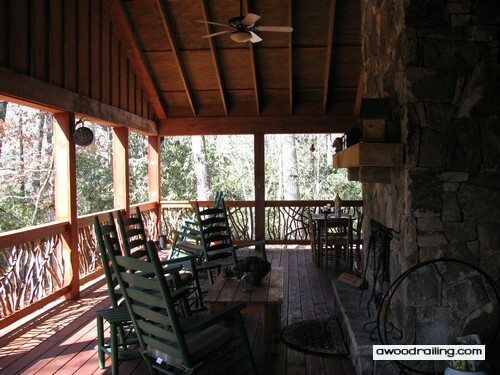 Relax with a cool afternoon breeze in a rocking chair on this porch deck. The railing design and stone fireplace are a great match. 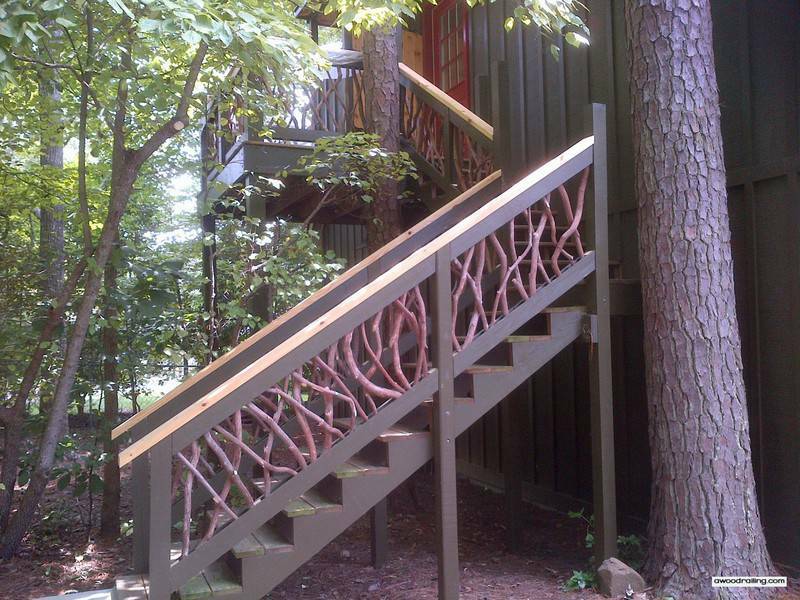 Mountain Laurel Handrails are available nation wide in easy to install sections. 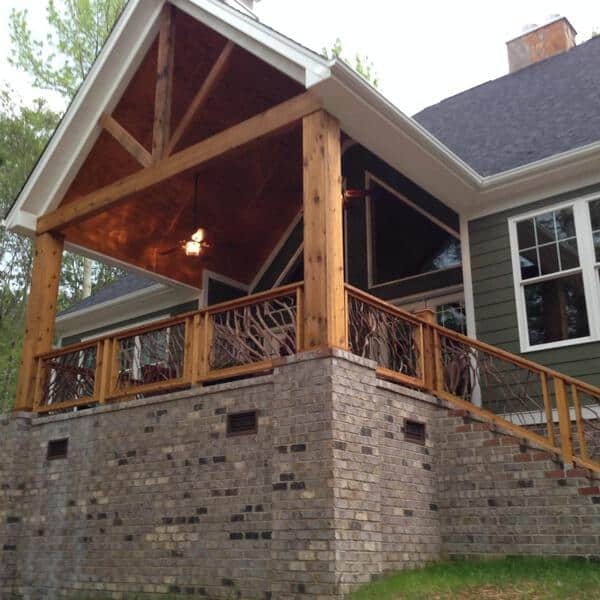 For a complete quote, please provide your total railing length and city/state for delivery. All railings are built one inch longer than actual measurements and are cut to fit on site. Imagine yourself relaxing in the mountains and enjoying the scenery. The porch and rocking chairs invite a tall glass of lemonade and maybe a cocktail! 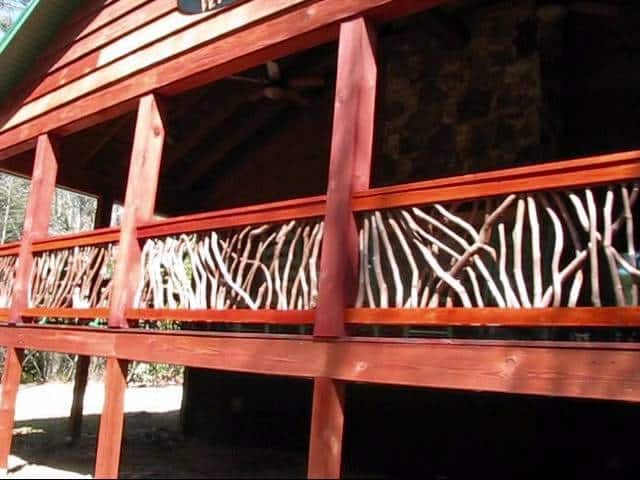 The inspired deck railing design add to the visual aesthetic and make an impression like no other! What a beautiful backdrop for this Mountain Laurel Handrail! 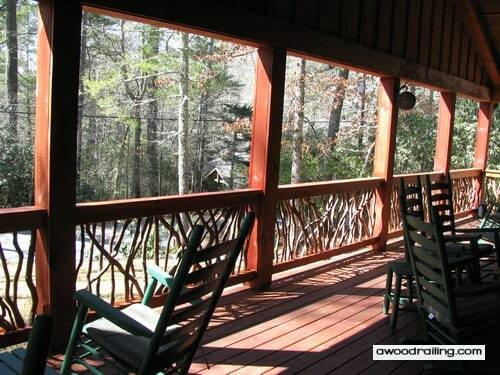 These deck railing pictures show the forest near the Blue Ridge Parkway in Western North Carolina which is the traditional setting for this artform. The curved and sinuous shapes of the rhododendron and mountain laurel trees inspired previous generations efforts to decorate their abodes and set the stage for this work you see here. The trees with yellow leaves in the picture are rhododendron trees in the fall. It’s an evergreen tree but drops old leaves in the fall. This project, like many, is custom and was closely coordinated between homeowner, design team and workshop. A good amount of woodwork like milling and roughing up lumber was required to achieve this elegantly spaced pattern. The homeowners vision of spacing and mass was translated by the designer in a series of drawings and achieved in the wood shop. As usual, the onsite contractor and carpenter assembled the railing with nice cuts and tight joints. The wood railing looks terrific installed. Looking forward to enjoying the porch soon. The one-of-a-kind Charlotte NC wood railing with its artistic flair was made to match this Arts and Crafts style home, perfectly. The porch features a beautiful blend of architectural shapes, textures and colors — an elevated brick base, floor to ceiling windows and a steeply pitched roof. 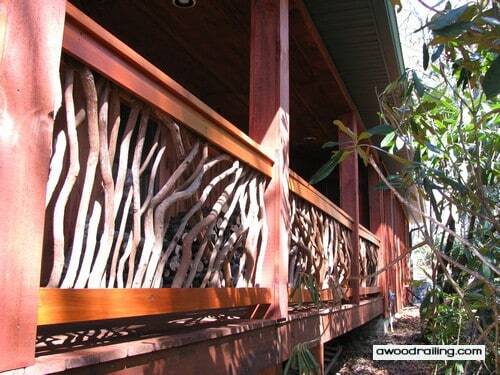 And natural branch handrails work harmoniously with all of these elements to create the captivating exterior. The railing’s quality craftsmanship really stands out in the picture above, and the installation and finishing are flawless to the last detail. A translucent stain preserves the inherent beauty of the wood used in the top and bottom rails, pillars and newel posts. This allows the grain to show through. At the same time, the branch balusters are left natural covered in their rich bark. While viewing this relaxing photo of the sitting area on the riverfront, it’s easy to take two key points concerning the handrail for granted. 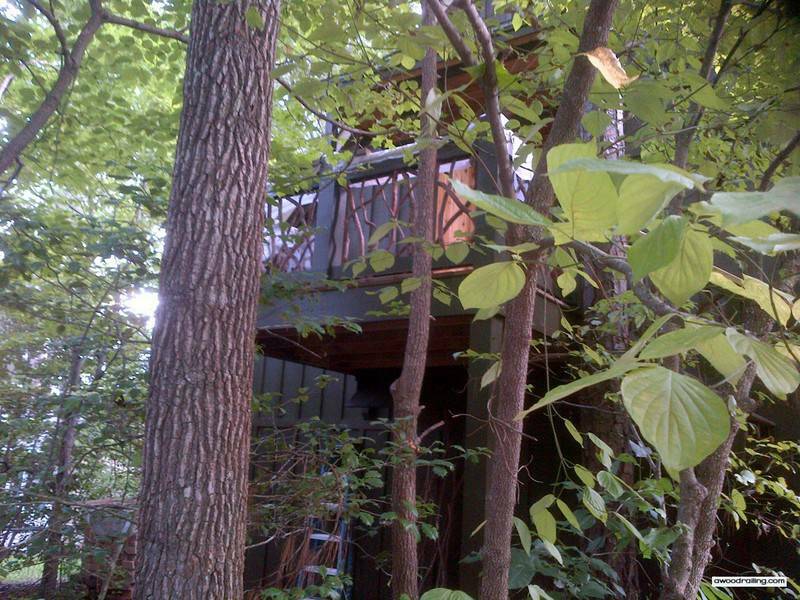 First, notice how the twig balusters blur the boundary between the porch and tree-lined landscape. 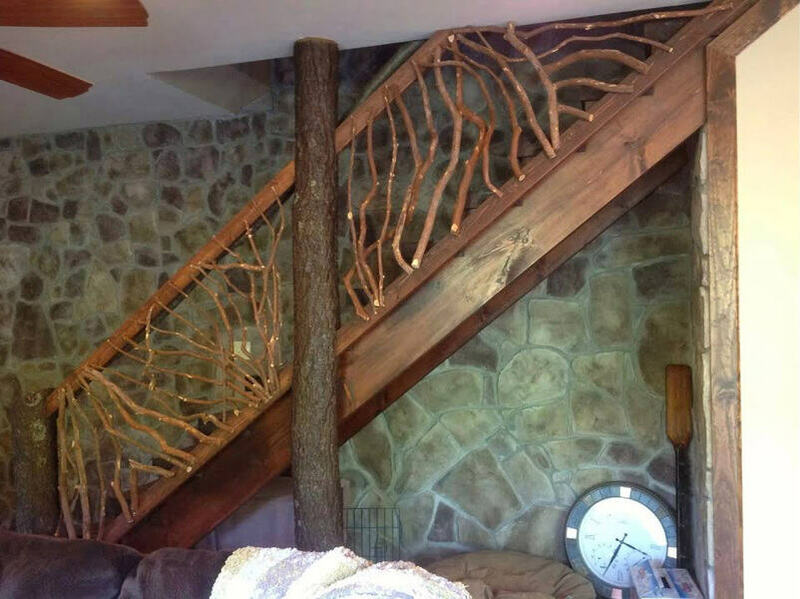 Clearly, wooden spindles or metal rods just wouldn’t have the same effect. 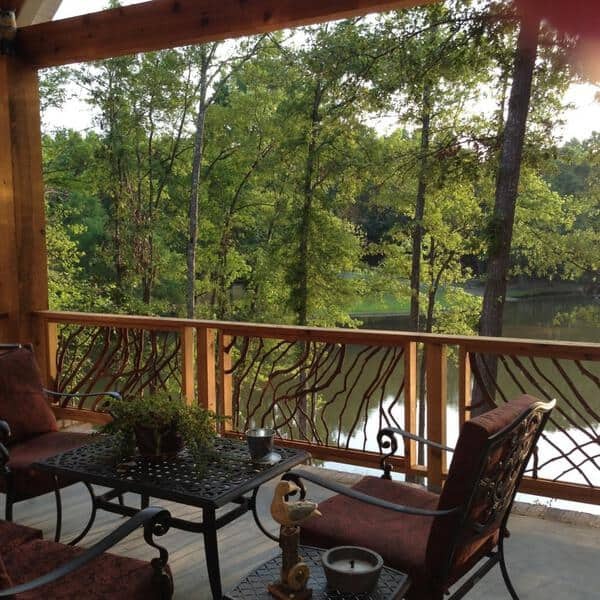 Second, the railing mingles well with wrought iron furniture. In fact, the sinuous branches mix nicely with many materials such as metal, wicker and glass. 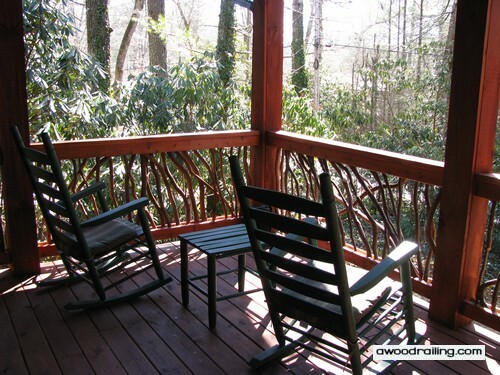 So, there’s no need to invest in new outdoor furniture if you’re updating a porch or deck with Mountain Laurel handrails. As you can see, this Charlotte NC wood railing is the central focal point in the height transition from the brick base to the pitched roof. If you’re looking to easily transform the plain appearance of your front porch, consider the look of outdoor art created by natural branch railings. 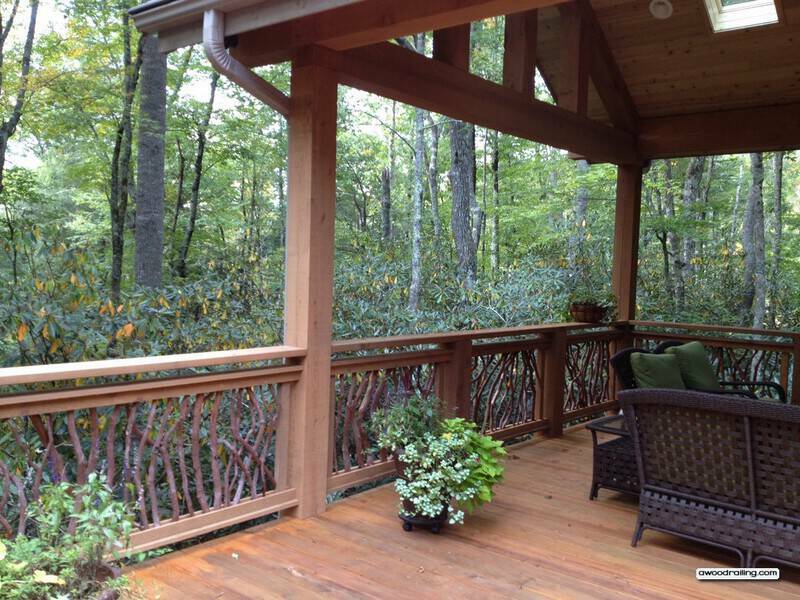 This handrail was built near Asheville, North Carolina by a customer who purchased mountain laurel material to build branch railings. 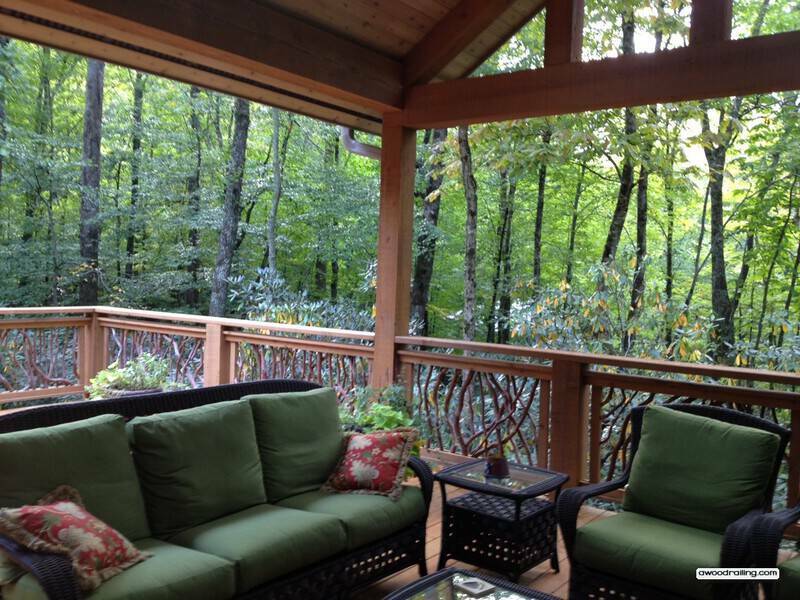 Deck railing in Asheville, North Carolina should be as beautiful as the surrounding scenery.